My time in the summer is not my own. It belongs to the bounty of the garden and the stove. You canners out there now what I'm talking about. 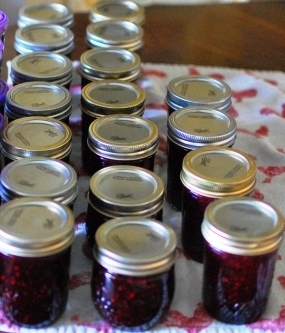 Any activity that goes on in the summer has to fit around the processing time of jars. Produce is usually bought in bulk and has to be dealt with fairly quickly. One stands barefoot in the kitchen (I do anyway) for at least 8 hours every day chopping, boiling, mashing, straining, etc. I love this time of the year. I get the itch right about the time we start planting a garden in the spring. I just want to put up stuff. I know, that's weird, but weird is how I roll. Last week I had 4 gallons of blackberries to deal with and so made 4 pints of blackberry freezer jam, 4 pints of blackberry syrup (recipe next week), 4 gallons of blackberry wine, and 9 pints of blackberry basil jam. I love pairing fresh herbs and fruit. It makes regular jam a little more special. You could substitute cinnamon basil, lemon balm (but I would only use 1/4c. since it is so strong) or any flavor of mint here. Squish blackberries and pectin together over low heat in a stainless steel pot. As they get softer, you can gradually turn up the heat so that the berries are at a boiling point. Once the mixture reaches boiling point, throw in all of the sugar at once and bring back up to a rolling boil. Boil hard for 1 minute. Cut off the heat and ladle in to sterile jars. Blackberries are just coming in on our mountain, will have to use this recipe! I know what you mean about the summer belonging to the garden and canning. I love the Blackberry and Basil combination. Hope you are having a great summer weekend and thank you so much for sharing with Full Plate Thursday. Fruit and herbs do complement each other so well. :) Thanks for stopping by!